This purse, Serenity by byannie.com, went together nicely. I was impressed with the directions and the kit. I did inadvertently reverse the purse flap, but it makes no difference. Also, I added a snap to the purse flap - you can see it one of the pictures here. In additon to an interior pocket, there is also a great functional pocket on the back. product by byannie.com), and one of her iPad carrier patterns, I think I have my next project! You start with a beautiful fabric. Then you add some free-motion quilting. 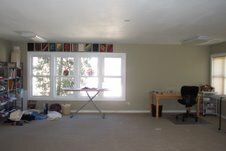 If you do your quilting with Texture Magic from byannie.com as the base, then the entire piece of fabric gently shrinks. I like this result and am eager to use this product again. When we were in Yellowstone National Park in May, John found these fabric photos of Yellowstone posters. Perfect for a quilted souvenir. And perfect for the studio bathroom. I love my Chicago Modern Quilt Guild. We do such cool things! At this month's meeting Sue Ryan led us in making quilting postcards. I was pretty skeptical about this. Really. Quilted postcards? It was a hoot! In 20 minutes I had completed one. Then I walked around the room to see what others were doing. Look at some of these postcards from yesterday. Here's the best part: these cards actually go in the mail! Hmmm, Christmas cards... Can't wait to get a couple of projects out of the studio so I can play with these! August 13 was International Left-Handers Day. Yes, I know it's August 18 today. I'm only five days late acknowledging this date. To right-handers this day may not seem significant. But being left-handed has been a life-long adjustment to right-handers and their world. 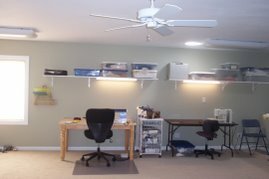 I have to teach cutting and quilting techniques with someone across from me, not next to me, and use mirror-imaging. Rather than continue to whine, I am celebrating with an entry in the First Annual International LEFT-HANDED Quilters Anonymous Online Quilt Show with my best quilt. 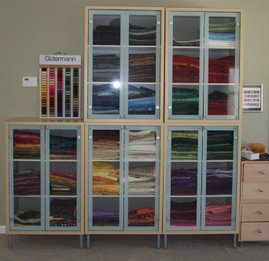 This is Jinny Beyer's Around the World design and her fabrics. The center and corners involved paper-piecing, a technique that baffles some left-handers. What I love about this quilt is its luminescence. It hangs in my studio. I do have to enter a second piece in the category of Best Quilt. Out of Africa is an original design and it represents one of my first attempts to break out of the traditional quilting mold. The center is woven, there's some interesting surface quilting, and the borders are read ethnic. The piece hangs at the Salt Creek Wine Bar in Brookfield, Illinois, where John and I had our 60th-70th birthday party almost two years ago. For more of this left-handed quilt festival, check it out here. In honor of a friend's birthday I am giving away five things. Last weekend at the White/Johnson wedding I gave my cousin Kathy a purse. And so I am counting that in my "birthday giveaway." Items 2 and 3 are here. I gave my mom her choice, and she chose the purse with blues. My sister-in-law Kim liked the brown ethnic-ish print, and Kim really liked the hidden pockets on the sides of her purse. Both of these have been made with Soft and Stable purse batting and have a great feel to them. After I organized my mom's new purse and the things in it, I took the empty purse and gave that to Kim also - I think my niece Laura might wind up using it as a book bag. Hmmm, does this count as the 4th give-away? This is the one I gave the Kathy - the first of my hobo bags, the one I forgot to put the pleat in. I love the fabrics, and this too has been lined with Soft and Stable . Round Robin - It's Actually Fun! The first time I heard of a "round robin," I wasn't at all intrigued. In fact, I remember thinking, "I don't ever want to do this." 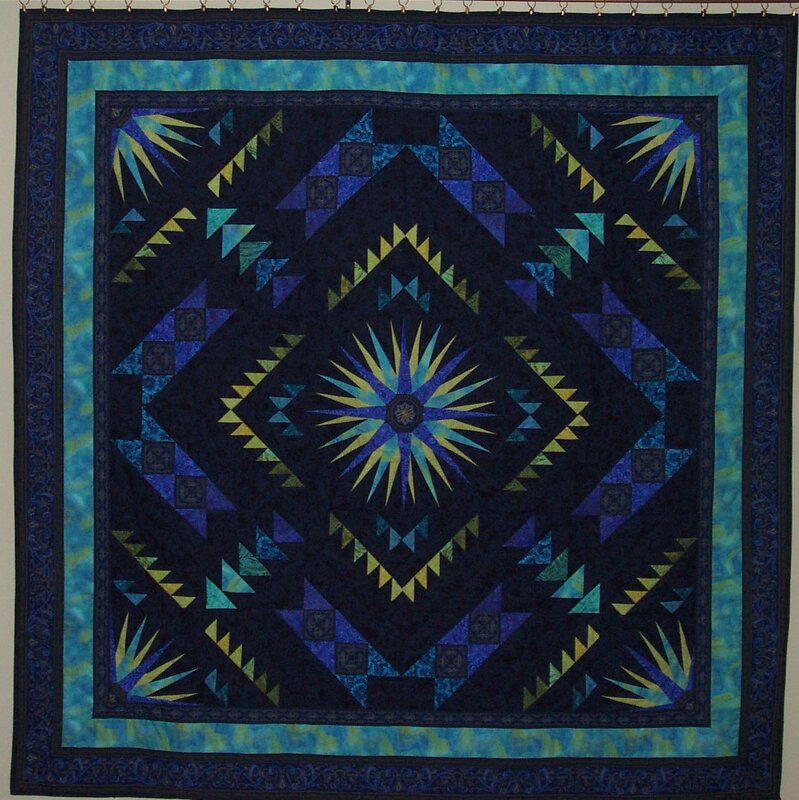 A round robin is a quilt that is done in stages by several quilters. Each quilter puts on a different round. 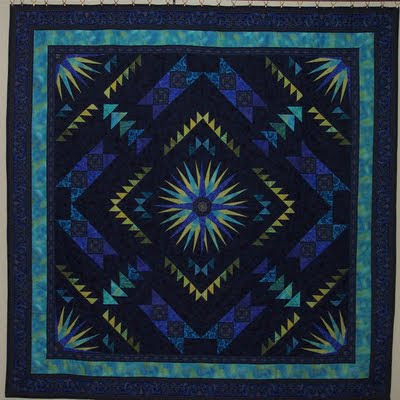 This piece above belongs to Sue Ryan, former Chicago Modern Quilt Guild treasurer and current programming committee member. Sue is a free spirit. This is the second time I've worked on something for Sue, and both have been liberating experiences. This round robin came after the CMGQ devoted its June meeting to applique techniques. Those who wanted to participate in the round robin brought in a 8" block featuring applique to the July meeting. Round One, due at the August 21 meeting, is rectangles. I used rectangles from my black and white collection, especially perfect since Sue incorporates black-and-white prints into all of her quilts. Rachel has my applique block, gave me a sneak peak, and I love what she's done with it. I'm really very excited to see all of our blocks with Round 1 completed and hear what the assignment is for Round 2 and what new block I get. So why is this fun now? I think the Round Robin project I saw had too many rules and too many constraints, too many matchy-matchy fabrics. Or maybe I'm just a better team player now. At any rate, this is fun! In fact, I'm surprised you recognize me at all. My laptop is at the hospital and will be for another few weeks. The way I carry on you would think I'm working with chisel and stone rather than my husband's computer. The parts for the Grand Canyon jacket are complete - with this technique it's like making four mini-quilts before constructing the garment. The collar is all cut out and ready for my sewing genius friend Midge. I'll have to figure out some way to reward her for her help. The three appliqued pieces done by fellow quilt guild members at a demo day are quilted and bound and ready for next week's meeting. One piece was echo quilted. Another was stippled. And the dark one is one that i quilted each individual shape. Great practce. If one person expresses interest, they are hers! I've finally settled on a palette for the Grand Canyon jacket. My friend/client lives in Racine and wants this jacket for her October European river cruise. I haven't made Morninglory's Town and Country Jacket for a couple of years and am looking forward to this project, even though I have never mastered the collar technique. Thank goodness for friends with skills! 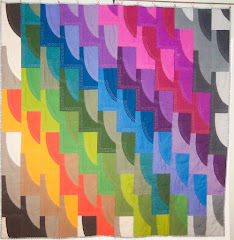 The June meeting of the Chicago Modern Quilt Guild was devoted to applique techniques. I demonstrated fusible raw-edge applique. Here are three pieces that groups put together using this technique. I said I would quilt these pieces and bring them in, but I was hoping no one heard me. But someone did. And asked about these pieces at the last meeting. So I do want to get these done for the August meeting. This one shares the same whimsy at the top piece. When John and I were out west in May, he found these fabric scenes of Yellowstone and bought them. This piece will hang in the studio bathroom, matching the colors of the walls and towels. A nice reminder of a lovely trip and a beautiful part of our country. I know two things about Erin - she's an English teacher and she's traditional. She mentioned that she liked my Aunt Betty's quilts. One is a quilt with red thread work (which I don't do). And she also said she liked blues. Not much to go on. But here's what I was thinking as I created this quilt. Matt is a golf course designer. Erin is traditional. And I haven't got a clue what their tastes are. So neutral was the way to go. This quilt has an architectural feel that Matt may appreciate. Erin comes from a tradition of quilting. My grandmother Eloise Sheehan White was a quilter. So was my aunt Jean White Gill. My cousin Jerry spent a summer with Aunt Jean in Alaska years ago when she was working on the pipeline. This quilt has been constructed using all the neutral white, creams, beiges, and greys from my stash with some blue batiks serving at the grout lines. It has a wonderful scrappy but unified look. There were "bricks" left over from the front of the quilt, and I used them to make a pieced backing. My friend Ebony long-armed this using a big loopy stipple - it's a soft look which contrasts with the hard lines of the design. The bottom picture shows her stitching. I'm mailing this quilt to the couple - it will be waiting for them in Virginia once their wedding is behind them! August already? Wow. Time is flying. These two hobo bags are complete. I added a D-ring to the brown one to make the strap longer, which is what one of the moms wanted to do. The blue one used the rest of a fabric that I have loved. Both of these will be samples for future workshops. The quilting is simple, and both bags are terrific. So, enough about purses for the time being. Let's move on to duffel bags. I really love how this turned out. It's big - 22" wide and 10" tall. I used Soft and Stable byannie.com - such a great purse lining. This pattern called for quilted material, and the bag would go together quickly if that was the starting point. Since I quilted my own, I had to adapt the pattern directions. Easy enough at this point. The only thing I would change now is the straps. For such a hefty bag, they should be wider. Next time. The inside of the bag has three pockets - the one here and then one on either end of the interior. I like how the zipper goes all the way across the bag, giving easy access to all parts of the interior. The wedding quilt for this Saturday was quilted by Ebony and is now ready to bind - the binding fabric is in the bottom right corner. A woman who was our our Great Parks of the West trip loved my quilted jacket and ordered one in "Grand Canyon" colors. This box of fabrics is the start of this palette, and now I just need to make some decisions and get busy. Finally, a jazz friend of John's has some interesting t-shirts and wants a reversible lap quilt with his shirts. He's a graphic designer and knows precisely what he wants. It was good to work with someone who knew exactly what fabrics he wanted incorporated into his quilt. So far I've stabilized these shirts with a thin fusible interfacing - just something to stop the stretching so I could cut them accurately. Here's to August and a continuation of the dog days of summer. I love my studio air conditioning.